Cat spraying is a normal phenomenon, which is usually carried out by cats so that they can mark their territory. In order to prevent your cat from spraying, you first need to understand the difference between cat urination and cat spraying. When a cat spreads a volume of urine on a horizontal surface it is known as cat urinating. While on the other hand when a cat spreads a small volume of urine on a vertical surface to leave a mark of her scent it is known as cat spraying. 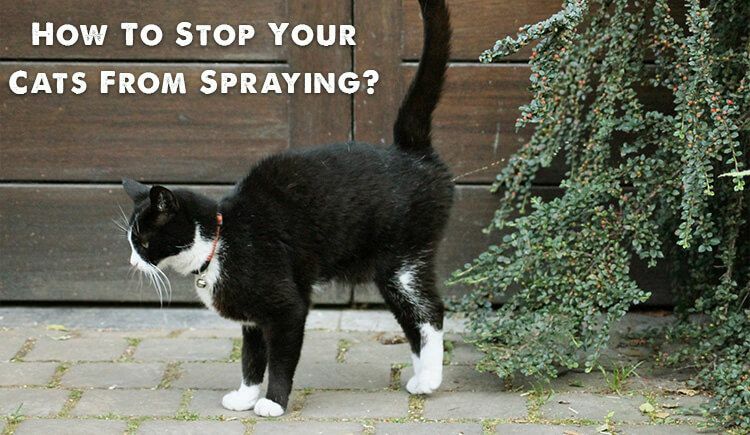 Let’s have a look at some ways that can help you prevent your cat from spraying. Cat spraying is a habit which should be corrected in a cat’s younger years. If not, this habit can continue in her older years and will create a problem for you. The best solution to this problem is that you can get your cat neutered or spayed before the age of 6 months. This will curb this behavior from developing when she hits puberty. Some cats do spray to get their owners attention. Try and spend as much time as you can with your cat. Cuddle with them or play games in order to make them feel loved. We know that cats can demonstrate aloof and independent behavior but they do desire attention from their owners. Many cats are prone to anxiety. They might not be able to convey their feelings directly and so they might try these habits to grab their owners attention. A cat’s anxiety can be due to various reasons, for example, a cat might feel anxious when she is left alone in the house while their owner leaves for work or she might feel jealous if there are two pets in the house and she doesn’t receive proper attention. In order to avoid this behavior spend lot of time with your kitty and make her feel special and loved. For extreme cases, you can even try Feliway spray to control this spraying behavior. As we know that a cat sprays in order to mark their territory, you can make sure that you keep stray cats away from your kitty. Cats can get very curious when they see other cats roaming in their territory and so they spray to give clear indications to the other pets that this is her territory. You can avoid feeding stray or neighborhood cats and you might see a significant improvement in your cat’s spraying habit. Your cat sprays as it is an instinctual habit for her. She doesn’t perceive your idea of space and so they behave in a particular manner to exercise their right on what they feel is theirs. You should not get mad at your cat and hit her for behaving in this way. This may make her feel less secure about her territory and can lead to more spraying. If your cat isn’t improving with her habit of spraying after you try different alternatives than it might be a wise idea to consult your vet for the same. Your cat might also spray due to a number of psychological issues. Kidney infection, feline lower urinary tract disease, diabetes, and thyroid or liver disease may also cause your cat to spray. Take appropriate measures and always consult your vet if you feel confused or stuck in a particular situation.